Impossible staircases, strange insect-like creatures furling and unfurling, a set of disembodied hands drawing each other into existence…. It was all so trippy and off-kilter that those of us who first saw the work of M. C. Esher in the 1960s and ‘70s simply assumed he was one of us—perhaps some acid-fueled poster artist from the Bay area. He was actually a Dutchman, Mauritis Cornelius Escher, who was born in 1898 and checked off the planet in 1972, just about the time Baby Boomers were checking him out. Moreover, he was more Straight Arrow than Acid Rocker and he drew his inspirations from Tuscan architecture and Moorish designers, not countercultural ideals. He blew his mind in San Gimignano, not San Francisco, and with mathematics, not controlled substances. The Currier Museum of Art in Manchester, New Hampshire, a small jewel, showcases Escher’s biography and work. It’s a perfect setting as, like Escher’s work, Manchester isn’t quite what first-time visitors expect. Once the world’s largest textile manufacturing center, Manchester is a gritty postindustrial city, whose red- brick factories stretch along the Merrimack River as far as the eye can see. Yet scattered among the decline are the remnants of the past wealth that endowed the Currier, and tenuous gentrification projects as fanciful as some of Escher’s works and might just fuel a brighter future. The Currier exhibit on Escher is exhaustive. It opens with Escher’s earliest commercial graphic works, nature studies, landscapes, and prints. 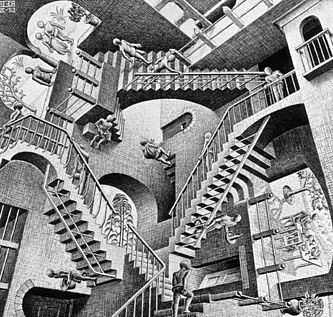 Escher gained such renown for his later mind-bending works that it’s easy to overlook his considerable printmaking skills. He excelled in all forms of printmaking—lithography, woodcuts, linoleum blocks, mezzotints, and several others that were unfamiliar to me. His artistic life took a dramatic turn when he toured Italy in 1922, the beginning of a journey that took him across Europe to study and work, but also to escape war. Italy’s medieval and Spain’s Moorish pasts precipitated a shift from pure to imaginative design. 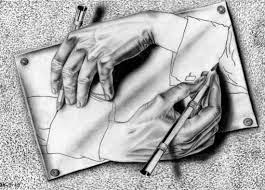 Escher had no formal training in mathematics, but non-representational geometry such as Möbius strips and ambiguous triangles became a staple of Escher’s works. The Currier exhibit highlights Escher’s draftsmanship and his intuitive grasp of both practical and improbable geometry. From Spanish tile makers he learned tessellation, patterns without overlap in which one design bleeds seamlessly into the next. A famed Escher technique was to begin with an abstract line of forms that slowly evolve into recognizable birds or insects. 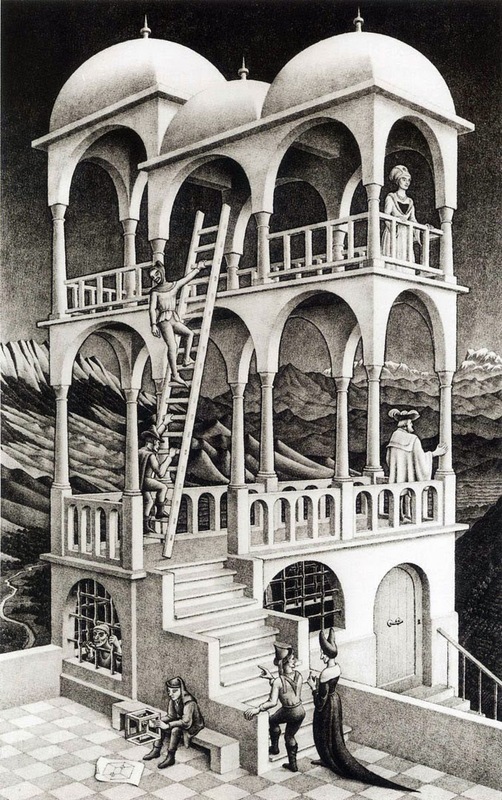 But look closely, as Escher liked to mess with our perceptions. Some of his tessellations construct, then deconstruct; others shift our focus in ways that we accept subconsciously before our reason centers alert us that we’ve been visually hoodwinked. 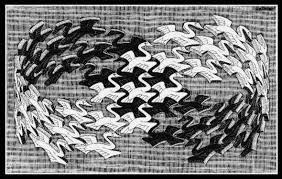 Escher often did this in the simplest possible manner, such as changing the flight patterns of a flock of birds by slowly adding one color while deemphasizing the previously dominant hue.